M is my mother. It was probably around 1995 when she started bushwalking as she needed something to do on weekends, get a bit of exercise and socialise. She found out about a bushwalking club and went to a meeting with a friend; the first outdoor event they attended was the day after the meeting, and they went mountain biking. They thought they’d use the momentum gained going down hills to come up the other side; this was a total failure and mountain biking was written off as a bad idea. 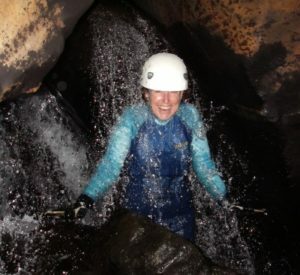 However, she did discover a whole new world out there that included off-track bushwalking, abseiling, canyoning and eventually caving. Most other people on weekends go to the beach, or to a friend’s house to use their pool, or maybe go to a neighbour’s house when they’re not home to use their pool. Some people even get gym memberships, having the convenience of a pool without having to maintain a pool. M on the other hand, as you will notice, prefers to find a swimming hole in the middle of nowhere; she will go out of her way to find a place that no one has built a road to, just so she can swim there. Most of these adventures are across largely untracked terrain and difficult to access, the philosophy being that if it’s easy to get to, everyone else can get there too. If you ever want to find M on a weekend, simply look in the places where no-one else wants to go. Also known for a wicked ability to start a fire, my mum does enjoy sitting around the campfire at night. Happy hour generally includes some culinary delights, cured meat, cheeses, and whatever else can be carried in, along with ten dollar cask wine. Nothing makes you forget the day’s bush bashing like two litres of cheap plonk around a camp fire. Unfortunately, there’s little photographic evidence of the trips pre-2005 mainly because there wasn’t a camera on the trip. Closer to the truth is that most cameras at that time wouldn’t have survived the sort of trips she was doing, they’d get wet, smashed, scratched or just lost. Plus, they were heavy, what would you choose, wine/cheese/crackers or camera – tough choice! These outdoor activities have dominated weekends for as long as her grandchildren can remember. They usually end with her being bruised, battered, scratched, sweaty and smelly, who in their right mind at her age does that to themselves? We’re not sure how much longer she will persist with this but she obviously loves it! I hope you enjoy reading of her adventures as much as I do. James (Jimmy) S.